For the similarly named event, see Kiev Arsenal January Uprising. The January Uprising (Polish: powstanie styczniowe, Lithuanian: 1863 m. sukilimas, Belarusian: Паўстанне 1863-1864 гадоў, Ukrainian: Польське повстання) was an insurrection instigated principally in the Russian Partition of the former Polish–Lithuanian Commonwealth against its occupation by the Russian Empire. It began on January 22, 1863 spread to the other Partitions of Poland and continued until the last insurgents were captured in 1864. It was the longest lasting insurgency in post-partition Poland. The conflict engaged all levels of society, and arguably had profound repercussions on contemporary international relations and ultimately provoked a social and ideological paradigm shift in national events that went on to have a decisive influence on the subsequent development of Polish society. It was the confluence of a number of factors that rendered the uprising inevitable in early 1863. The Polish nobility and urban bourgeois circles hankered after the semi-autonomous status they had enjoyed in Congress Poland before the previous insurgency, a generation earlier in 1830, while youth encouraged by the success of the Italian independence movement urgently desired the same outcome. Russia had been weakened by its Crimean adventure and had introduced a more liberal attitude in its internal politics which encouraged Poland's underground National Government to plan an organised strike against their Russian occupiers no earlier than the Spring of 1863. They had not reckoned with Aleksander Wielopolski, the pro-Russian arch-conservative head of the civil administration in the Russian partition, who got wind of the plans. Wielopolski was aware of his fellow countrymen's fervent desire for independence was coming to a head, something he wanted to avoid at all costs. In an attempt to derail the Polish national movement, he brought forward to January the conscription of young Polish activists into the Imperial Russian Army (for 20-year service). That decision is what triggered the January Uprising of 1863, the very outcome Wielopolski had wanted to avoid. The rebellion by young Polish conscripts was soon joined by high-ranking Polish-Lithuanian officers and members of the political class. The insurrectionists, as yet ill-organised were severely outnumbered and lacking sufficient foreign support, and were forced into hazardous guerrilla tactics. Reprisals were swift and ruthless. Public executions and deportations to Siberia eventually persuaded many Poles to abandon armed struggle. In addition, Tsar Alexander II hit the landed gentry hard, and as a result the whole economy, with a sudden decision in 1864 to finally abolish serfdom in Poland. The ensuing break-up of estates and destitution of many peasants convinced educated Poles to turn instead to the idea of "organic work", economic and cultural self-improvement. Despite the Russian Empire losing the Crimean war and being weakened economically and politically, Alexander II warned in 1856 against further concessions with the words, "forget any dreams". There were two prevailing streams of thought among the population of the Kingdom of Poland at the time. One consisting of patriotic stirrings within liberal-conservative usually landed and intellectual circles centred around Andrzej Zamoyski. They were hoping for an orderly return to the constitutional status pre-1830. They became characterised as the Whites. The alternative tendency, characterised as the Reds represented a democratic movement uniting peasants, workers, and some clergy. For both streams central to their dilemma was the peasant question. However estate owners tended to favour the abolition of serfdom in exchange for compensation, whereas the democratic movement saw the overthrow of the Russian yoke as entirely dependent on an unconditional liberation of the peasantry. Just as the democrats organised the first religious and patriotic demonstrations in 1860, covert resistance groups began to form among educated youth. Blood was first shed in Warsaw in February 1861, when the Russian Army attacked a demonstration in Castle Square on the anniversary of the Battle of Grochów. There were five fatalities. Fearing the spread of spontaneous unrest, Alexander II reluctantly agreed to accept a petition for a change in the system of governance. Ultimately he agreed to the appointment of Aleksander Wielopolski to head a commission to look into Religious Observance and Public Education and announced the formation of a State Council and Self-governance for towns and Powiats. These concessions did not prevent further demonstrations. On 8 April there were 200 killed and 500 wounded by Russian fire. Martial law was imposed in Warsaw and brutally repressive measures taken against the organisers in Warsaw and Wilno by deporting them into deepest Russia. In Vilno alone 116 demonstrations were held during 1861. In the autumn of 1861 Russians had introduced a state of emergency in Vilna Governorate, Kovno Governorate and Grodno Governorate. These events led to a speedier consolidation of the resistance: Future leaders of the uprising gathered secretly in St. Petersburg, Warsaw, Wilno, Paris and London. Two bodies emerged from these consultations. By October 1861 the urban "Movement Committee" (Komitet Ruchu Miejski) was formed and in June 1862 the "Central National Committee", CNC came into being. Its leadership included, Stefan Bobrowski, Jarosław Dąbrowski, Zygmunt Padlewski, Agaton Giller, and Bronisław Szwarce. This body directed the creation of national structures intended to become a new secret Polish state. The CNC had not planned an uprising before the Spring of 1863 at the earliest. However, Wielopolski's move to start conscription to the Russian Army in mid January, forced its hand to call the uprising prematurely on the night of 22–23 January 1863. The uprising broke out at a moment when general peace prevailed in Europe, and although there was vociferous support for the Poles, powers such as France, Britain and Austria were unwilling to disturb international calm. The revolutionary leaders did not have sufficient means to arm and equip the groups of young men who were hiding in forests to escape Alexander Wielopolski's order of conscription into the Russian army. Initially about 10,000 men rallied around the revolutionary banner. The volunteers came chiefly from city working classes and minor clerks, although there was also a significant number of the younger sons of the poorer szlachta (nobility) and a number of priests of lower rank. Initially, the Russian government had at its disposal an army of 90,000 men under Russian General Anders Edward Ramsay in Poland. It looked as if the rebellion might be crushed quickly. Undeterred the CNC's provisional government issued a manifesto in which it declared "all sons of Poland are free and equal citizens without distinction of creed, condition or rank." It decreed that land cultivated by the peasants, whether on the basis of rent or service, henceforth should become their unconditional property, and compensation for it would be given to the landlords out of State general funds. The provisional government did its best to send supplies to the unarmed and scattered volunteers who, during the month of February, had fought in eighty bloody skirmishes with the Russians. Meanwhile, the CNC issued an appeal for assistance to the nations of western Europe, which was received everywhere with supportive sentiments, from Norway to Portugal. Italian, French and Hungarian officers answered the call. Pope Pius IX ordered special prayers for the success of Catholic Poles in their defence against the Orthodox Russians, and was generally active in raising support for the Polish rebellion. By late spring, early summer of 1863, historian Jerzy Zdrada records there were 35,000 Poles under arms facing a Russian Army of 145,000 in the Polish Kingdom alone. On February 1, 1863, the Uprising erupted in Lithuania. 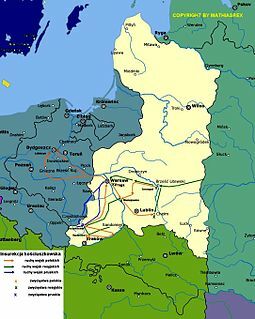 During April and May it had spread to Dinaburg, Latvia, and Witebsk, Belarus, to the Kiev Governorate, northern Ukraine and to the Wolynian Voivodship. Volunteers, weapons and supplies began to flow in over the borders from Galicia in the Austrian Partition and from the Prussian Partition. Volunteers also arrived from Italy, Hungary, France and from Russia itself. The greatest set-back was that in spite of the liberation manifesto from the KCN, without prior idealogical agitation, the peasantry could not be mobilised to participate in the struggle, except in those regions that were dominated by Polish units, which saw a gradual enrolment into the Uprising of agricultural workers. The secret Polish state was directed by the Rada Narodowa, RN, (National Council) to which the civil and military structures on the ground were accountable. It was a "virtual coalition government" formed of the Reds and the Whites. It was led by Zygmunt Sierakowski [pl; uk], Antanas Mackevičius and Konstanty Kalinowski. The latter two supported their counterparts in Poland and adhered to common policies. Its diplomatic corps was centred on Paris under the direction of Wladyslaw Czartoryski. The eruption of armed conflict in the former Commonwealth of Two Nations had surprised western European capitals, even if public opinion responded with sympathy for the rebel cause. It had dawned on Paris, London, Vienna as well as on Saint Petersburg that the crisis could plausibly turn into a new war with Russia. For their part, Russian diplomats considered the uprising an internal matter, while European stability was generally predicated on the fate of Poland's aspiration. The uncovering of the existence of the Alvensleben Convention signed on 8 February 1863 by Prussia and Russia in St. Petersburg to jointly suppress the Poles, internationalised the Uprising. It enabled Western powers to take the diplomatic initiative for their own ends. Napoleon III of France, already a sympathiser with Poland, was concerned to protect his border on the Rhine and turned his political guns on Prussia with a view to provoking a war with it. He was simultaneously seeking an alliance with Austria. The United Kingdom on the other hand, sought to prevent a Franco-Prussian war and to block an Austrian alliance with France and looked to scupper any rapprochement between France and Russia. Austria was competing with Prussia for leadership of the German territories, but rejected French approaches for an alliance, spurning any support of Napoleon III as acting against German interests. There was no discussion of military intervention on behalf of the Poles, despite Napoleon's support for the continuation of the insurgency. France, the United Kingdom and Austria agreed a diplomatic intervention in defence of Polish rights and in April issued diplomatic notes that were intended to be no more than persuasive in tone. The Polish RN was hoping that the evolution of the insurgency would ultimately push western powers to adopt an armed intervention, which was the flavour of Polish diplomatic talks with those powers. The Polish line was that the establishment of continued peace in Europe was conditional on the return of an independent Polish state. With the threat of war averted, St.Petersburg left the door open for negotiations, but was adamant in its rejection of any western rights to armed conflict. In June 1863 western powers iterated the conditions: an amnesty for the insurgents, the creation of a national representative structure and the development of autonomous concessions across the kingdom, a recall of a conference of Congress of Vienna (1815) signatories and a cease fire for its duration. This fell well below the expectations of the leadership of the Uprising. While concerned by the threat of war, Alexander II felt secure enough with the support of his people to reject the proposals. Although France and the UK were insulted, they did not proceed with further interventions which enabled Russia to extend and finally break off negotiations in September 1863. Apart from the efforts of Sweden, diplomatic intervention by foreign powers on behalf of Poland were on balance unhelpful in drawing attention away from the aim of Polish national unity towards its social divisions. It alienated Austria, which hitherto had maintained a friendly neutrality towards Poland and had not interfered with Polish activities in Galicia. It prejudiced public opinion among radical groups in Russia who, until then, had been friendly because they regarded the uprising as a social rather than a national insurgency and it stirred the Russian government to an ever more brutal suppression of hostilities and repression against its Polish participants that had grown in strength. In addition to the thousands who fell in battle, 128 men were hanged under the personal supervision of Mikhail Muravyov 'Muravyov the Hangman', and 9,423 men and women were exiled to Siberia - 2,500 men according to Russia's own estimates. The historian Norman Davies gives the number as 80,000, noting it was the single largest deportation in Russian history. Whole villages and towns were burned down. All economic and social activities were suspended and the szlachta was ruined through confiscation of property and exorbitant taxes. Such was the brutality of Russian troops that their actions were condemned throughout Europe. Count Fyodor Berg, the newly appointed governor, Namiestnik of Poland, and successor to Muravyov, employed harsh measures against the population and intensified systematic Russification in an effort to eradicate Polish traditions and culture. During the first 24 hours of the uprising armouries across the country had been looted, and many Russian officials were executed on sight. 2 February 1863 saw the start of the first major military engagement of the uprising between Lithuanian peasants, mostly armed with scythes and a squadron of Russian hussars outside Čysta Būda, near Marijampolė. It ended with the massacre of the unprepared peasants. While there was still hope of a short war, insurgent groups merged into bigger formations and recruited new volunteers. "has concluded a military convention with the Russian Government, according to which the two governments will reciprocally afford facilities to each other for the suppression of the insurrectionary movements which have lately taken place in Poland and Lithuania. The Prussian railways are also to be placed at the disposal of the Russian military authorities for the transportation of troops through Prussian territory from one part of the former Polish-Lithuanian commonwealth to another." This step by Bismarck led to protests from several governments and incensed the several constituent nations of the former Commonwealth. The result was the transformation of a relatively insignificant uprising into another "national war" against Russia. Encouraged by promises made by Napoleon III, all the provinces of the erstwhile Commonwealth, acting on the advice of Władysław Czartoryski, had taken to arms. Moreover, to Indicate their solidarity, all Commonwealth citizens holding office under the Russian government, including the Archbishop of Warsaw, Zymunt Feliński, resigned their positions and signed their allegiance to the newly constituted Government, which was composed of the five most prominent representatives of the Whites. The Reds meanwhile criticised the Polish National Government for being reactionary with its policy to incentivise Polish peasants to fight in the uprising. The Government justified its inaction on the back of hopes of foreign military intervention promised by Napoleon III. It never materialised. It was only after Polish general Romuald Traugutt took matters into his own hands on 17 October 1863 to unite all classes under a single national banner that the struggle could be upheld. His restructuring in preparation for an offensive in spring 1864 was banking on a European wide war. On 27 December 1863 he enacted a decree of the former provisional government by granting peasants the land they worked. This land was to be provided by compensating the owners through state funds after the successful conclusion of the uprising. Traugutt called upon all Polish classes to rise against Russian oppression for the creation of a new Polish state. The response was moderate since the policy came too late. The Russian government had already begun working among peasants granting them generous parcels of land for the asking. Those peasants who had been bought off did not engage with Polish revolutionaries to any extent nor did they provide them with support. Fighting continued intermittently during the winter of 1863-4 on the southern edge of the Kingdom near the Galician border from where assistance was still forthcoming. In late December in the Lublin Voivodeship General Michał Heydenreich's unit was overwhelmed. The most determined resistance continued in the Swietokrzyskie hills where general Józef Hauke-Bosak distinguished himself by taking several cities from the vastly superior Russian forces. Yet he too succumbed to a crushing defeat on 21 February 1864 which presaged the end of the armed struggle. On 29 February Austria imposed martial law and on 2 March the tsarist authorities brought in the abolition of serfdom in the Polish Kingdom. These two events neutralised Traugutt's concept of developing the uprising with a general mobilisation of the population in the Russian partition and reliance on assistance from Galicia. In April 1864 Napoleon III abandoned the Polish cause. Władysław Czartoryski wrote to Traugutt: "We are alone, and alone we shall remain". Arrests decimated key positions in the secret Polish state, while those who felt threatened sought refuge abroad. Traugutt was taken on the night of 10 April. After he and the last four members of the National Council, Antoni Jezioranski, Rafał Krajewski, Józef Toczyski and Roman Żuliński had been apprehended by Russian troops, they were imprisoned and executed by hanging on 5 August at the Warsaw Citadel. It marked the symbolic closure of the Uprising. Only Aleksander Waszkowski, head of the Warsaw insurgency eluded the police till December 1864, but then he too joined the list of "the lost" in February 1865. The war consisting of 650 battles and skirmishes with twenty-five thousand Polish and other insurgents killed, had lasted eighteen months. It is worthy of note that the insurgency persisted in Samogitia and Podlasie, where the Greek-Catholic population, outraged and persecuted for their religious observance, "Kryaki", (those baptised into the Greek orthodox church), and others like commander and priest, Fr. Stanisław Brzóska, clung longest to the revolutionary banner until the spring of 1865. After the collapse of the uprising, harsh reprisals followed. According to official Russian information, 396 persons were executed and 18,672 were exiled to Siberia. Large numbers of men and women were sent to the interior of Russia and to the Caucasus, Urals and other remote areas. Altogether about 70,000 persons were imprisoned and subsequently exiled from Poland and consigned to distant regions of Russia. The abolition of serfdom early in 1864 was deliberately enacted in a move designed specifically to ruin the szlachta. The Russian government confiscated 1,660 estates in Poland and 1,794 in Lithuania. A 10% income tax was imposed on all estates as a war indemnity. Only in 1869 was the tax reduced to 5% on all incomes. It was the only time when peasants paid the market price for redemption of the land (the average for the Russian Empire was 34% above the market price). All land taken from Polish peasants since 1864 was to be returned without compensation rights. Former serfs could only sell land to other peasants, not to szlachta. 90% of the ex-serfs in the empire who actually gained land after 1861 were confined to the 8 western provinces. Along with Romania, Polish landless or domestic serfs were the only people eligible for land grants after serfdom was abolished. All this was to punish the szlachta's role in the uprisings of 1830 and 1863. In addition to the land granted to the peasants, the Russian government gave them forest, pasture and other privileges (known under the name of servitutes) which proved to be a source of incessant irritation between the landowners and peasants over ensuing decades, and an impediment to economic development. The government took over all church estates and funds, and abolished monasteries and convents. With the exception of religious instruction, all teaching in schools was ordered to be in Russian. Russian also became the official language of the country, used exclusively in all offices of central and local government. All traces of former Polish autonomy were removed and the Kingdom was divided into ten provinces, each with an appointed Russian military governor and all under the control of the Governor-General in Warsaw. All former Polish government functionaries were deprived of their positions and replaced by Russian officials. According to George Kennan, "thousands of Polish insurgents" were transported to the "Nerchinsk silver-mining district...after the unsuccessful insurrection of 1863." These measures of cultural eradication proved to be only partially effective. In 1905, 41 years after Russia crushed the uprising, the next generation of Poles rose once again in the next insurrection. It too failed. The January Uprising was one in a centuries long series of Polish uprisings. In its aftermath two new movements began to evolve that set the political agenda for the next century. One, led by the descendant of Lithuanians, Jozef Pilsudski emerged as the Polish Socialist Party. The other, led by Roman Dmowski became the National Democracy movement sometimes referred to as Endecja whose roots lay in Catholic conservatism that sought national sovereignty along with the reversal of forced Russification and Germanisation through Polonisation of the partitioned territories in the former Commonwealth. Anna Pustowojtówna, alias "Michał Smok"
Stanisław Brzóska (1832–1865), was a Polish priest and commander at the end of the insurrection. Saint Albert Chmielowski (1845–1916), founder of the Albertine Brothers and Sisters. Jaroslaw Dabrowski (1836-1871), officer in the Russian Army, left-wing member of the "secret committee" of officers in St. Petersburg. He took over its leadership from Sierakowski. He died in Paris fighting for the Paris Commune. Konstanty Kalinowski (1838–1864), was one of the leaders of Lithuanian and Belarusian national revival and the leader of the January Uprising in the lands of the former Grand Duchy of Lithuania. Saint Raphael Kalinowski (1835–1907), born Joseph Kalinowski in Lithuania, resigned as a Captain from the Russian Army to become Minister of War for the Polish insurgents. He was arrested and sentenced to death by firing squad, but the sentence was then changed to 10 years in Siberia, including a grueling nine-month overland trek to get there. Apollo Korzeniowski (1820–1869), Polish playwright and father of Joseph Conrad. Marian Langiewicz (1827-1887), Military Commander of the uprising. He had an English wife, Suzanne, next to whom he was buried in Istanbul. Ludwik Mierosławski (1814-1878), veteran of the November Uprising and of the Greater Poland uprising (1846), general, strategist, writer and emigrant with wide foreign contacts. Władysław Niegolewski (1819–1885), was a liberal Polish politician and member of parliament, an insurgent in the Greater Poland Uprisings of 1846 and 1848 and of the January 1863 Uprising, and a co-founder (1861) of the Central Economic Society (TCL) and (1880) the People's Libraries Society (CTG). Francesco Nullo (1826-1863) Italian general who headed the Garibaldi Legion, and though small, it carried huge symbolic value. Nullo died at the Battle of Krzykawka. Bolesław Prus (1847–1912), leading Polish writer of historical novels. Anna Henryka Pustowójtówna (1838-1881), alias "Michał Smok", adjutant to Marian Langiewicz. She was of Russian-Polish parentage and an activist from 1861. She later took part in the Paris Commune and the Franco-Prussian War. She died in Paris, the mother of four children. François Rochebrune, (1830-1870), one of several French officers in the Uprising, he formed and led a Polish rebel unit called the Zouaves of Death and was promoted to General. Aleksander Sochaczewski (1843–1923), Polish painter. Romuald Traugutt (1826-1864), a Lieutenant colonel of German descent in the Russian Army, he was promoted general in the insurrection, was its leader for a spell and held the Foreign Affairs portfolio in the underground government. He was tortured and hanged by the Russians with several of his colleagues. Falling into the late romantic period the events and figures of the Uprising inspired many Polish painters, including Artur Grottger, Juliusz Kossak and Michał Elwiro Andriolli and marked the delineation with the positivism that followed. Polish poet Cyprian Norwid wrote a famous poem, "Chopin's Piano," describing the defenestration of the composer's piano during the January 1863 Uprising, when Russian soldiers maliciously threw the instrument out of a second-floor Warsaw apartment. Chopin had left Warsaw and Poland forever shortly before the outbreak of the November 1830 Uprising. Eliza Orzeszkowa, a leading Polish positivist writer and nominee for the Nobel Prize in Literature wrote Nad Niemnem a novel set in and around the city of Grodno after the 1863 January Uprising. Józef Jarzębowski has put together material from unknown people who lived through the Uprising in his Mówią Ludzie Roku 1863: Antologia nieznanych i małoznanych Głosów Ludzi współczesnych. London: Veritas, 1963. ("Voices from 1863: An Anthology of unknown and little known contemporary Perspectives"). In the initial draft of Twenty Thousand Leagues Under the Sea by Jules Verne (but not in the published version), Captain Nemo was a Polish nobleman whose family had been brutally murdered by the Russians during the January 1863 Uprising. Since France had only recently signed an alliance with the Russian Empire, in the novel's final version Verne's editor, Pierre-Jules Hetzel, made him obscure Nemo's motives. In Guy de Maupassant's novel Pierre et Jean, the protagonist Pierre has a friend, an old Polish chemist who is said to have come to France after the bloody events in his motherland. This story is believed to refer to the January Uprising. ^ Chisholm, Hugh, ed. (1911). "Wielopolski, Aleksander". Encyclopædia Britannica. 28 (11th ed.). Cambridge University Press. p. 622. ^ Maciej Janowski (2004). "The Rise of Positivism". Polish Liberal Thought Before 1918. Central European University Press. p. 166. ISBN 9639241180. Retrieved September 7, 2012. ^ Piotr S. Wandycz, The lands of partitioned Poland, 1795-1918, University of Washington Press, 1974, p. 166. ^ Norman Davies (1996). Europe: a history. Oxford University Press. pp. 828–. ISBN 978-0-19-820171-7. Retrieved 2 February 2011. ^ Adam Bruno Ulam (1977). Prophets and conspirators in prerevolutionary Russia. Transaction Publishers. pp. 8–. ISBN 978-0-7658-0443-3. Retrieved 2 February 2011. ^ Sikorska-Kulesza, Jolanta (1995). Deklasacja drobnej szlachty na Litwie i Białorusi w XIX wieku. Pruszków, PL: Ajaks. p. 29. ISBN 9788385621379. ^ Зайцев, В. М (1973). Социально-сословный состав участников восстания 1863 г. (Опыт статистического анализа) [Social-estates composition of the participants in the uprising in 1863 (attempt at statistical analysis)] (in Russian). Москва: Наука. ^ Историк: 'В 1863 году белорусы поддержали не Польшу и Калиновского, а Россию и государя' [Historian: 'In 1863, Belarusians did not support Poland and Kalinowski, only Russia and its sovereign']. regnum.by (in Russian). 2013-01-23. Archived from the original on 2013-09-27. ^ Józef Jarzębowski. Węgierska polityka Traugutta: na podstawie znanych i nieznanych dokumentów. Warszawa 1939. ("Traugutt's Hungarian policies"). ^ Jarzębowski, Józef. Traugutt, nakładem Archidiecezjalnego Instytutu Akcji Katolickiej, Warszawa, 1938. ^ Jarzębowski, Józef. Traugutt: dokumenty, listy, wspomnienia, wypisy. Londyn: Veritas, 1970. ^ Kennan, George (1891). Siberia and the Exile System. London: James R. Osgood, McIlvaine & Co. p. 280. Wincenty Konstanty Kalinowski, also known as Kastuś Kalinoŭski, Konstanty Kalinowski (Polish) and Konstantinas Kalinauskas (Lithuanian), was a 19th-century Belarusian writer, journalist, lawyer and revolutionary. He was one of the leaders of the Belarusian, Polish and Lithuanian national revival and the leader of the January Uprising in lands of the former Grand Duchy of Lithuania in the Polish-Lithuanian Commonwealth. Romuald Traugutt was a Polish general and war hero best known for commanding the January Uprising of 1863. From October 1863 to August 1864 he was the leader of the insurrection. He headed the Polish national government from 17 October 1863 to 20 April 1864, and was president of its Foreign Affairs Office. The Battle of Buda Zaborowska, one of many skirmishes of the January Uprising, took place on April 14, 1863, near the village of Buda Zaborowska in central part of Russian-controlled Congress Poland. Polish forces under Major Walery Remiszewski clashed with troops of the Imperial Russian Army. The battle resulted in Russian victory. Ignacy Mystkowski was a Polish railroad engineer who became a commander of insurgent forces during the period of the January Uprising and was promoted to the rank of lieutenant-colonel. Józef Jarzębowski, b. 26 November 1897 in Warsaw - d. 13 September 1964 in Herisau, Switzerland, was a Polish-born Roman Catholic priest, member of the Marian Fathers. He was an educationalist, historian, writer and noted antiquarian.